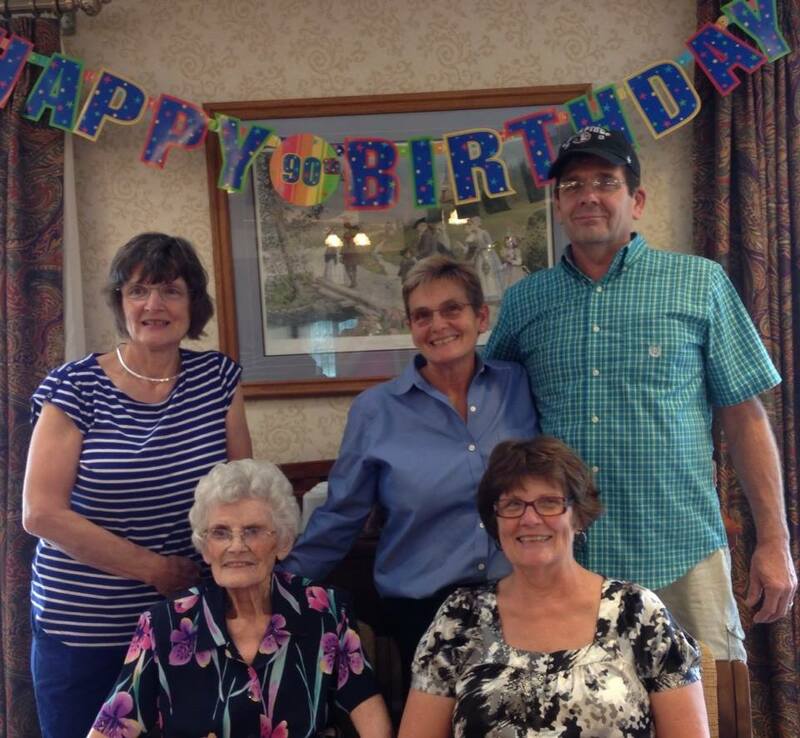 A little over a week ago my family celebrated my mother’s 90th birthday. She’s joining an increasingly popular and not uncommon club. Walking the loop around the lovely pond at her retirement community later in the week, my mother and I ran into a tall and vigorous Mennonite leader, Simon. At one time he was on the board of the organization I worked for as Mennonite Board of Missions. I greeted him enthusiastically and told him we had just feted my mother for her 90th birthday. Ninety is the new 80 is the new 70 and so on. Two months earlier, I joined mom for her friend Cora’s 90th birthday party, where we kind of got some ideas about what we’d like to do or not do at Mom’s. They had a fantastic brunch which looked like a huge amount of work. We stuck with cake, ice cream, nuts and punch, and invited two very willing helpers to assist us from Mom’s church North Goshen Mennonite: Rachel and Ruth Ann. 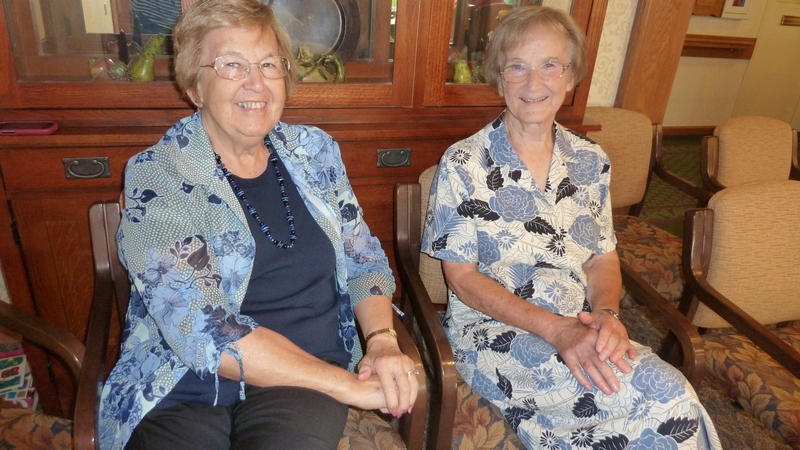 If they sound Biblical, they are in terms of being gracious servants—in fact Rachel had made it a practice for a period of years to plan 90th birthday parties for a total of 14 people from her church or family. Ruth Ann is amazing because she had survived a brain aneurysm a few years ago, and was privileged to interview her about for a short-lived radio program (you can read or hear her program here). With my sibs and Mom: me, Mom, Pert, Nancy and Terry. However, tempering my joy in helping mom celebrate this big milestone birthday, I had to think of those so much younger whose lives were snuffed out before they could see their kids graduate from high school, before they could see their daughters married, before they could jiggle a grandson on the knee. Why do so many reach the age of 90, 100 and even 105 and up, while folks in their 50s and 60s are succumbing to cancer, heart attacks, brain tumors? Mom had just survived her own cancer scare with major surgery two months earlier. Why was she living at age 90 and my pastor’s husband did not live to see 60? Cousin Miriam greets Mom at the party. The whys are unanswerable and they give pause to all of us. When big birthdays roll around, the celebrations remind us to just be grateful for the present, pull our loved ones a little tighter, let loose of old arguments a little quicker, and reach out with all the love and compassion and attention we can muster for those going through the difficult times that do come to us all. Those who gathered for Mom’s evening pizza party for family. Mom’s great granddaughter Asa, sitting on grass second from left with head on her sister Eve’s shoulder, also celebrated her 5th birthday that evening! Asa said the prayer for our pizza. 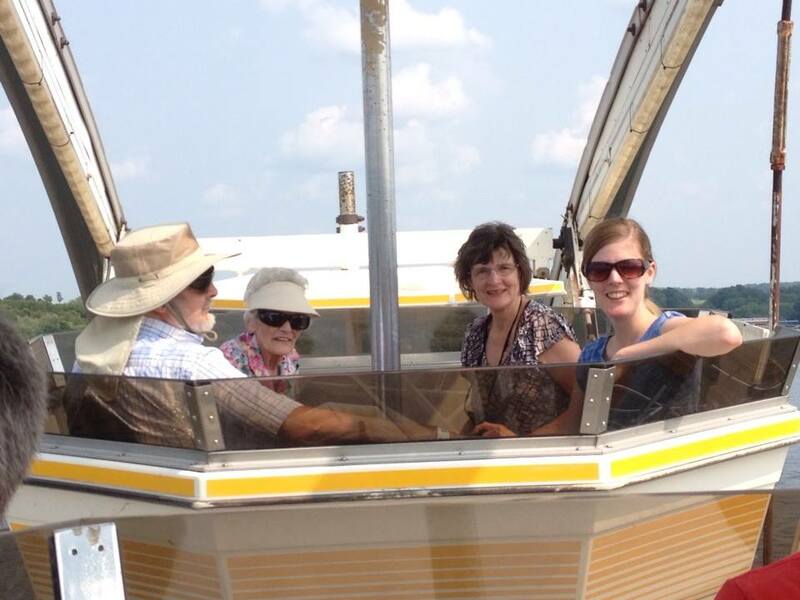 The day after Mom’s party, she wanted two things: a Ferris wheel ride and a boat ride. She had heard about Indiana Beach Amusement Park, a smallish, older style park close to Lafayette which had reasonable weekday rates. To her, the park was huge, overwhelming. She was thinking of the amusement park she and Dad went to in the 40s when they were dating. Would she be able to keep up with toddlers, teenagers and her kids, just two months out from surgery? 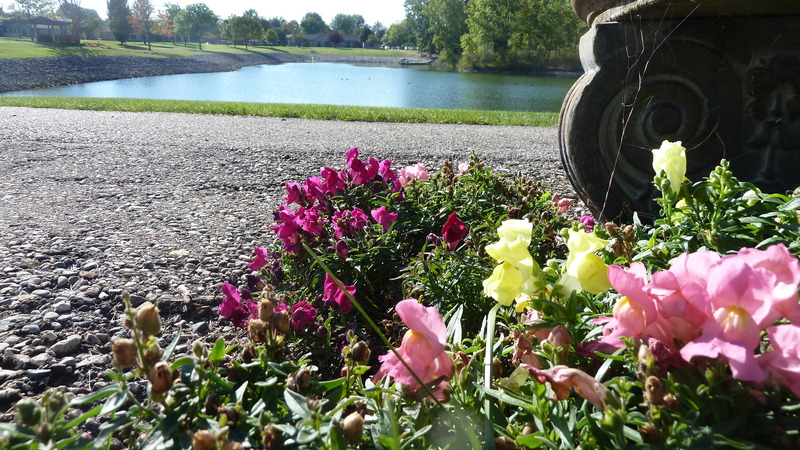 With the help of a wheelchair, she could and did, and a grand time was had by all on a comfortable Indiana day. My husband Stuart, Mom, yours truly, and our youngest daughter, Doreen, on Ferris wheel (more like a gondola) at Indiana Beach. Go Mom. We are grateful, for each and every day. Who is the oldest person you know personally? How old would you like to live to be? We gave our helpers each a copy of Mennonite Girls Can Cook Celebrations, (now with new dust jacket) which seemed like a fitting book for their efforts. If you’ve never checked it out or the blog it comes from, head over here for the blog and here for the book. Such a heart warming writing of your mom’s 90th birthday party that she celebrated with family and friends.. He didn’t make it to his 91st but he lived a great life and had relatively good health in his later years. We have had many our older friends who have also reached this milestone and are still active and great people to have as friends. 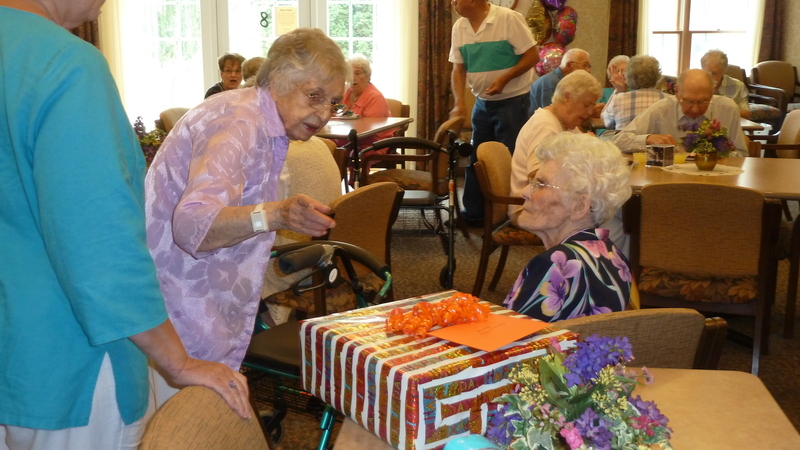 We have also attended some who had 95th birthdays and one who reached 100! I have been privileged to do the photos at several of their parties. Continued blessings on your mom and family. That’s the thing–to have good health for most of one’s life–that’s more important than age, right? Thanks for weighing in. So are you a photographer (more than me)? Professional? Semi-pro? You do have some lovely photos of your grandchildren I’ve noticed. I did have a singing ministry for over 40 years but I developed a neurological disability called dystonia about 10 years ago that involves involuntary muscle spasms in my eyes, face , vocal chords and other parts of my body. I now get injections in my eyes, face and vocal chords and can no longer sing and talking at times is difficult. It has been a great loss for me but fortunately, although I cannot do a lot physically, I can still do my photography. 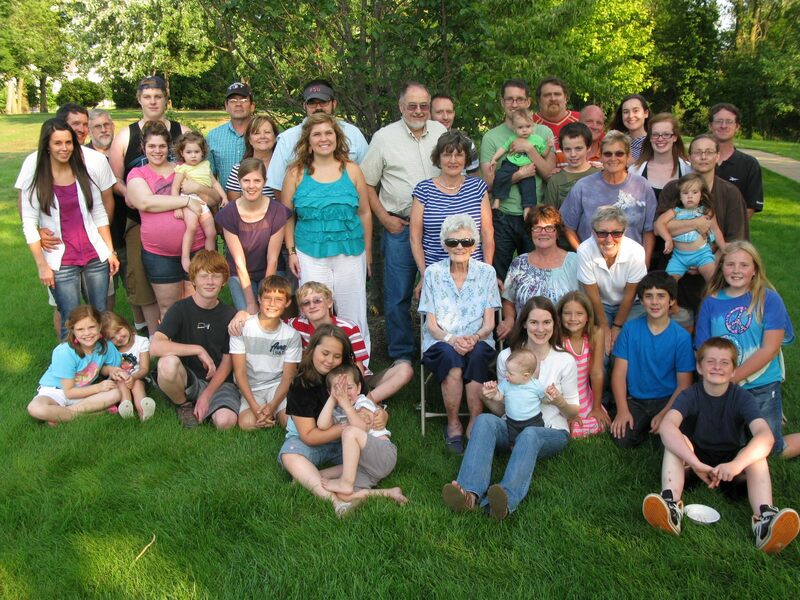 Of course the grandchildren and great grand babies are always lots of fun to do as well,. I wish I had known to take courses before I got married but back in the 50’s I don’t think I would have even known to do that. God is good though and I am happy do do what I can do now. Oh wow, I didn’t know. Thanks for sharing more of your story. So writing your thoughts out is likely easier than talking? Taking courses in photography back in the 50s would have been very unusual, I agree! Cameras were different, photography was different. It is neat that you can do what you do now. Amen! I had not heard of dystonia. Maybe I could share your story sometime on Another Way, as a guest writer? Think about it! Yes some days it is easier to write than talk but I have always been a very social person and love talking to people so it can be frustrating at times when I am talking, especially to new people. They will often ask if I have a sore throat and I explain I have a neurological problem that affects my vocal chords . They always look at me with a big question mark as most people do not have a clue what I am talking about. My husband tells me I hid behind my camera when we are out at a party where there are lots of people and I am doing the picutres for the family . I can talk to people for a brief time and then move on! I am on several FaceBook closed support groups for people with various types of Dystonia . We can share with one another and it can be very emotional when you find other people who have the same type as you and they undersatnd what even the doctors can’t. We are very much into awareness and as a matter of fact, Septemeber is Dystonia Awareness month in some parts of the country. I will consider your invitation to maybe write something for your column sometime in the future when I get caught up on some of my photographic back log projects! I will try to find the link again and share it with you. My mother has just left the 90-club as you may know from recent posts. We are mourning her loss but are grateful for her 96 years + 5 days on this earth. She was the oldest person I knew personally. Now it is my aunt who is 3 months younger. 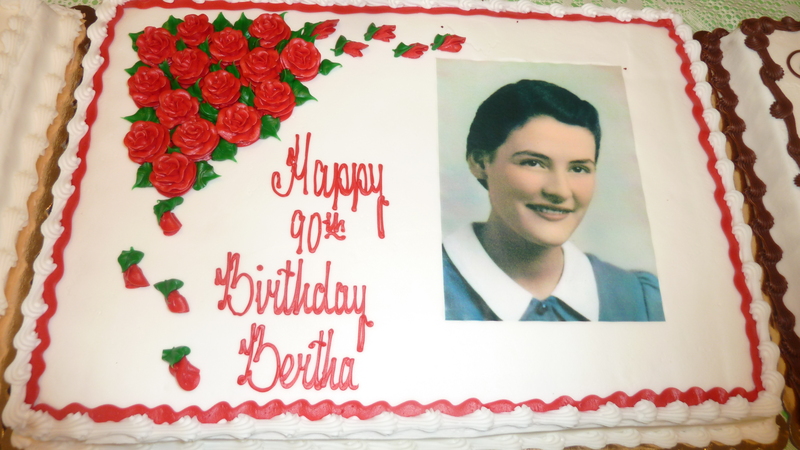 We had a huge birthday blast for her 90th which included a celebration for her sister-in-law also named Ruth Longenecker and with the same middle initial “M.” Our celebration included a slide-show of both of their lives and posters enumerating their accomplishments. Precious memories . . . how they linger! How long do I want to live? I have been saying this for years now: “I don’t want to lose my mind or my waist-line before I die.” One of those benchmarks is seriously in question these days. Great post! I wasn’t sure who had gone from your family circle; I am sure it has been a time of grief even though you have much to rejoice at. I’m glad you could spend the recent time with her, too. Nice to hear about your slide show. We had a big poster with photos mom picked out illustrating her life … but she had dismantled it before I got to take a picture! Anyway, I agree about not wanting to live past the days of an alert and useful mind. Mom can’t hear very well but at least she has good eye sight and a sharp mind. Thanks for letting me know what has happened these last weeks for you and best wishes as you remember and process this change and huge loss. Hi Melodie, Your Mom’s 90th birthday celebration description brought my church friend to my mind. At 96 she is the oldest living member of our 150 year old church and was Baptized on our site. I am most fortunate because she has a keen mind. Since I am our church business manager, there are times when I need an explanation for a wall opening, a support, a sealed opening, a drain, or pretty much anything. Then she smiles, explains what happened at the time, and why the condition is what I see currently. She is the surviving twin, has a caretaker of sorts, a faithful weekly attender of our church services, does her own driving in a 4WD SUV (it is allowed in New Jersey at 90 plus years) and is an all-around joy. She has a smile that puts my smile to shame. I am hopeful that this will be how and what people feel about me, should God keep me around for those next 20 years. Thanks for the “tickle” of my memory. Awesome story, a true wonder woman to be driving in NJ. Wow! Don’t we love those who are walking pieces of history; my husband misses so many elder gentlemen who have now died at our church who used to have that kind of institutional memory for our church. To have lived 96 of the 150 years of your church is amazing. Thanks so much for chiming in. My mother is 87.5 years old and still lives independently at Landis Homes in Pennsylvania. My siblings and I are very grateful for our presence in our lives, and she has been holding lots of great grandchildren lately. I love it that you took your mom to an amusement park and went on the Ferris Wheel. I hope Mother will be able to do something as spunky when her day comes. One of the greatest pleasures of publishing Blush last year was having her in many audiences and honoring her influence in my life through sharing some of her story in my memoir. Mom used to aspire to a hot air balloon ride which we considered but thought it was too iffy in terms of weather conditions. Maybe your mother will be up for that! When I told the friend we were staying with that we were taking Mom on a Ferris wheel at her request, she just laughed and said “Oh my, that would be the last thing I’d want to do … not liking heights.” I will tell more about mother’s Ferris wheel jaunts in a new post. In your book I marveled at how much of the first part of the story was really your mother’s, and it helps us think about how much our parents formed us, sometimes for better, sometimes for worse. We have a 103 year old woman at church, Zella. I can’t think of another over 100, but lots in their 90’s. Our church will be 165 in October. She married into the church. He passed quite awhile ago and she lives with one of her son’s and his family. Sadly she is starting to show very early signs of dementia. She still sang in the choir till about age 96. I have lots of aunts and uncle’s 70”s to 90’s. My mother recently lost an older sister Verena. She is one of ten. A brother August, died during the war years…he was doing his service at the nearby “asylum” as it was called at the time and died after being attacked by an inmate. My father was 2nd youngest of 8 boys. He passed (I mentioned that in a previous post) . He has 3brothers left, all in the 80’s and 90’s. In fact we just visited that side a few weeks ago when we got together for a double bridal shower and a baby shower. How long do I want to live? I can’t say, but God knows. Was your mother’s brother a C.O. doing alternative service in the asylum. I knew that work was hard (my father served in this way too) but I don’t know if I had ever heard of someone dying from an attack. Sad. I don’t think I currently and personally know anyone over 100 either, but lots in their 90s. I would say showing signs of dementia at age 103 is not too bad, but still sad to see when it is a person you know and love! Thanks for all your comments! Yes, he was. He took a pretty good bang to the head, but kept working. Only had a headache…but collapsed a few days later. No one really offered an explanation to my grandparents, as far as I know.. I suppose there would have been possibly a hemorrhage or an aneurysm. Medicine way more advanced now…he would have had a brain scan or something I suppose in today’s time. Well that is interesting, and tragic. Thanks for letting me know. Sad. 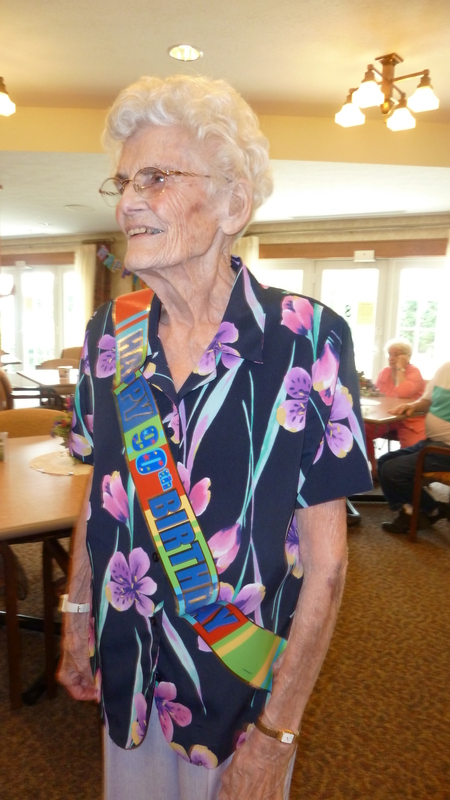 What a wonderful celebration you had with your spry, spunky young-90 Mother! Kudos to your mom and her youthful and enthusiastic spirit! When I found some 1934 quilt squares at a yard sale in California, and found they came from Athelstan, Iowa, I donated the squares to the Taylor County Historical Museum. When I delivered them in 2014, I met Ellen, their oldest volunteer who was 99 at the time. She continued volunteering at the museum and singing with her church choir until the time of her death at 102. My mom just turned 81, and now she seems like such a youngster! I love your story of Ellen, as well. Yes, 81 is not very old anymore!! Thanks for commenting here, Trisha.